Food, kids, books, and other writing. Independence Tavern opened in early February in the location that used to house Buddha’s Belly. 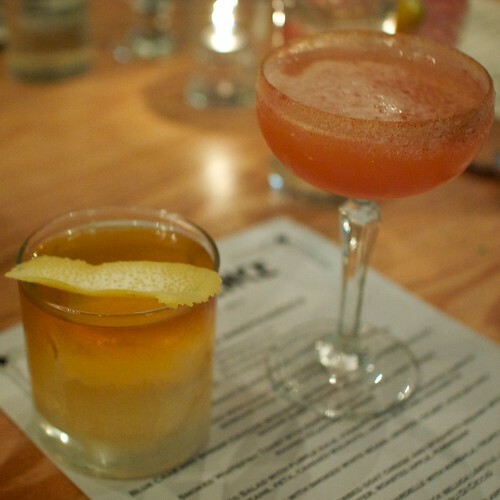 Named after the steam-powered railroad line that once ran from Santa Monica to San Pedro, it is now a New American style restaurant with an impressive menu and cocktail pedigree. Tom Block, a friend who used to work at Beelman’s Pub, became the executive chef at Independence Tavern invited me for a hosted dinner to sample their offerings. 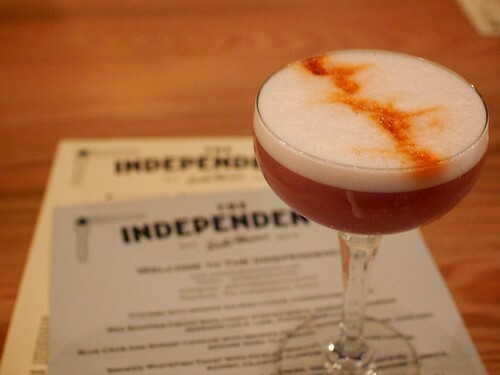 The cocktail menu at Independence Tavern is overseen by Vincenzo Marianella of Copa d’Oro, which is conveniently located just a few doors down. Rumor has it that he has a trap door that allows him to move between bars without having to step outside. I started off with The Longshore, a bourbon-based cocktail that’s a little like an Old Fashioned and a little like a flip. It is has an astringent flavor profile, which suited me fine. First came a wooden plank of oysters on a half shell. 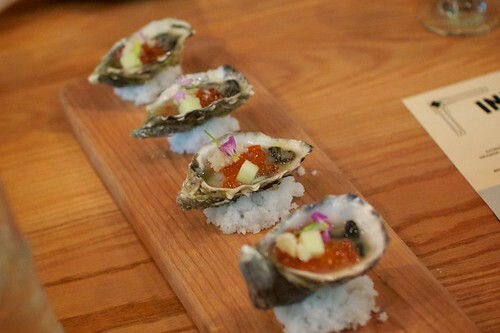 The oysters were accompanied by smoked salmon roe and a delicate cube of apple. The sweet crunchiness of the apple was a pleasant contrast to the briny oysters and roe. 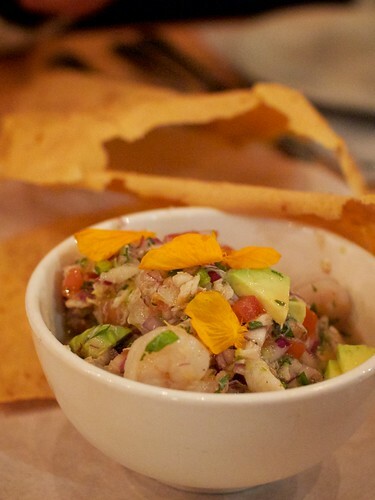 Next came a shrimp and crab ceviche served with a flatbread more like a papadum than a tortilla. The crisp flatbread worked well as a tool to deliver bites of tender shrimp and crab. Around the same time we were all digging into ceviche, another bowl of raw fish arrived. 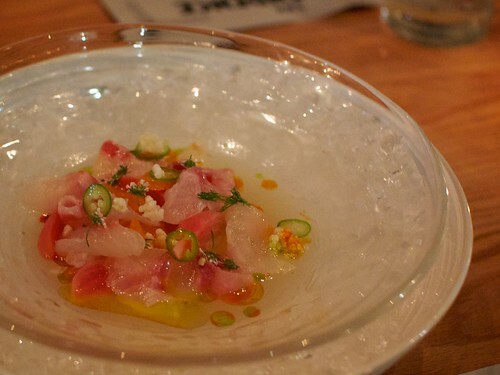 This time it was a red snapper crudo with candy striped beets, tangerines, serrano pepper, lime, and puffed rice. I loved the variety in texture and the heat of the slices of spicy pepper, but the bites that I had were a little too sweet. 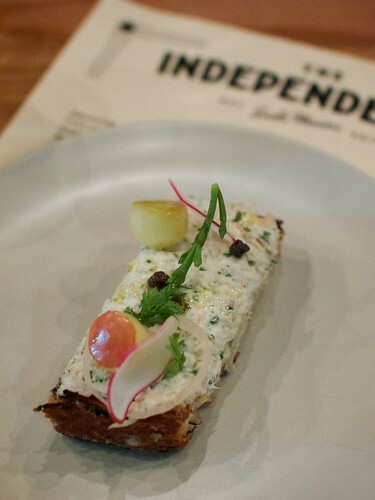 Then came a beautifully plated slice of toast slathered with a smoked whitefish mixture that included shallot, apple, fried capers, radish, and garnished with cilantro blossoms. This was a unanimous crowd favorite. The toast was already cut into four pieces, which I was grateful for. There’s nothing harder than trying to divy up a piece of toast in a neat manner. 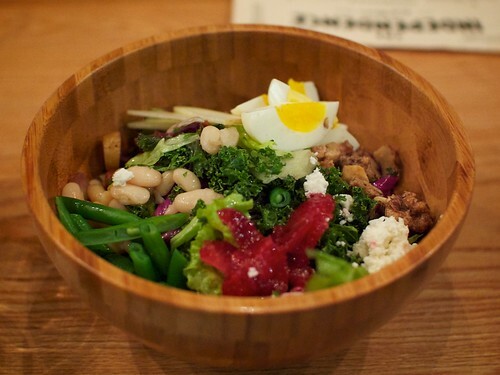 To refresh our palates from all the fish, a rainbow-hued bowl of chopped salad came out. Curled leaves of purple kale, an egg, roasted carrots, green beans, smoked white beans, feta, and candied walnuts was delicately dressed with a lemon mustard vinaigrette. This crunchy bowl of vegetables was both healthy and appetizing, which I know can be hard to accomplish. Vegetarians will be pleased to know that the roasted mushrooms with the 62 degree egg and yuzu kosho hollandaise was egg-cellent. Yes, I went there. 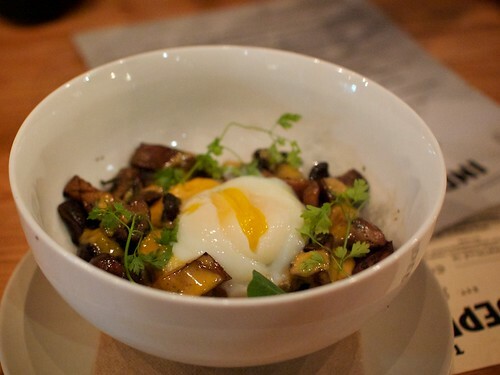 The meatiness of the mushrooms and the rich egg yolk make you forget that there’s no meat in this dish. The sharp fragrance of the yuzu helps keep the mushrooms’ earthiness in check. Next came one of my favorite dishes of the night, which was the grilled octopus. 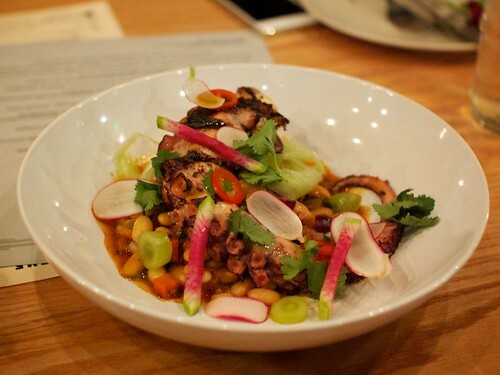 The octopus arm was served whole — great presentation which made me think of 20,000 Leagues Under the Sea. Not only did this dish look good, but it tasted fantastic. The octopus was unbelievably tender while still retaining its core texture. The beans, grapes, celery, and pickled chili sounded like a strange conversation, but each element worked well together to form a cohesive dish. After that, we were served a tortellini duo: some stuffed with herbed goat cheese and others with spaghetti squash with brown butter, roasted apple, and parmesan. I did not win the tortellini lotto and only managed to pick out the spaghetti squash-filled ones, but that was fine. Following that pasta dish was another pasta dish with venison ragu. 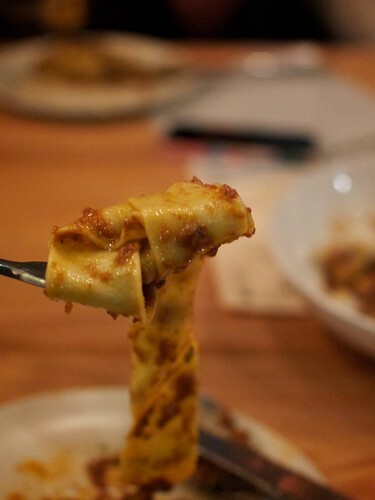 The house made pappardelle was good, but I found the ragu a bit salty. 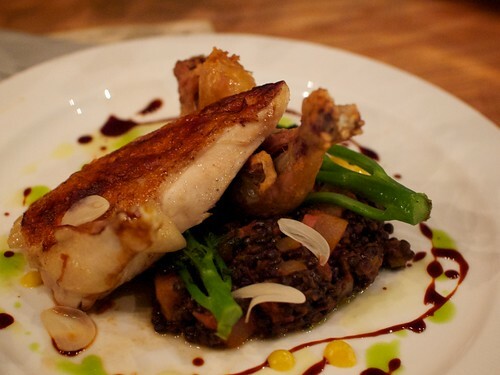 Then came a roast chicken with beluga lentils, leg confit, guanciale, and broccoli di ciccio. I really liked the sweet, snappy broccoli with its spritz of lemon. I had mistaken a cube of guanciale for a cubed potato in the dim lightning, but it was a great surprise for my mouth. 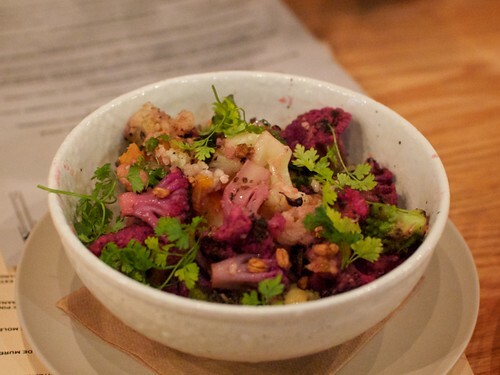 The dark horse of the night was the spicy cauliflower with preserved lemon and Thai chili. The colorful cauliflower and Romanesco broccoli was crisp, but not hard, and the preserved lemon dressing was perfect. If this were served on top of some puffed rice, I could see it becoming a popular vegetarian or even vegan entree. A dish I’d like to refer to as The Flavorbomb came out to top off the meal. The rack of lamb with Thai red curry rub, smoked eggplant puree, coconut, and bok choy was a memorable way to end the night. 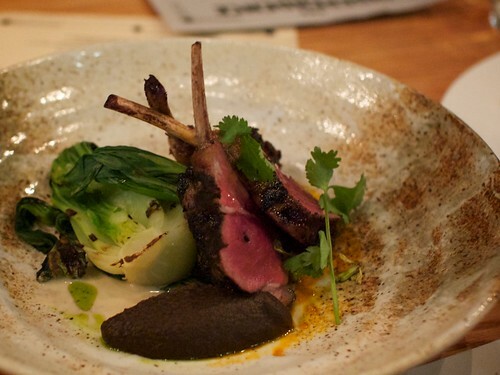 The lamb was cooked perfectly, but what really got everyone talking was the eggplant puree. Its dramatic black color and intense smokiness really outshone everything else on the plate for the other diners. Personally, I really liked the combination of the Thai red curry and the bok choy. Toward the later half of the meal, I ordered a second cocktail: The Smoke of Scotland. With its cask strength Laphroig scotch, it really packs a punch. The peaty flavor of the cocktail makes it a great sipper, but not something I would recommend to eat before or with a meal. I was concerned that the elderflower liquor would be too cloying, but I actually didn’t detect any hint of it in the cocktail. Lesson learned: trust Vincenzo. I may be biased because the chef is a friend, but the menu at Independence Tavern is great, especially the “Sea” section. 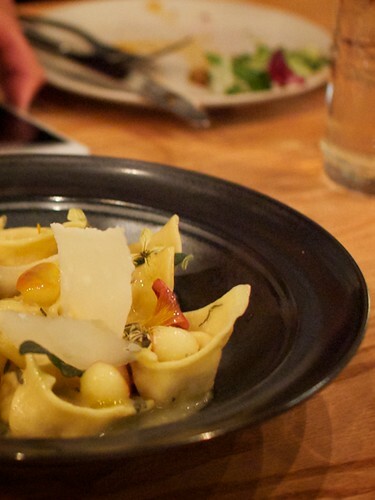 The dishes on it manage to be exciting and different while still being accessible to most palates. What’s even better is that the kitchen is willing to accommodate most vegetarian and vegan diets. I hear with enough advance notice, they can even put together a vegan tasting menu. For those who only want to stick with what they know, there is also a pretty tame sandwich and burgers section. 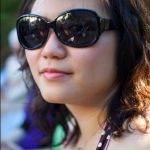 Louise Yang writes software by day and reviews by night. She likes eating and cooking food, spending time away from the computer, taking pictures, and getting lost in a book.